This was not a happy day. Without divulging too many details, the ex came over to hang out and clean, and we got into the same old discussion we’ve been having since we broke up. It’s painful, and I think we both end up saying hurtful things to one another. Both of us genuinely want to be friends, but right now, it’s just not possible. It took every ounce of strength in me to tell him that I didn’t want to speak to him or see him again for a while. I haven’t ruled out ever being friends, but right now, I can’t. It felt like we were breaking up all over again. I felt shattered…again. 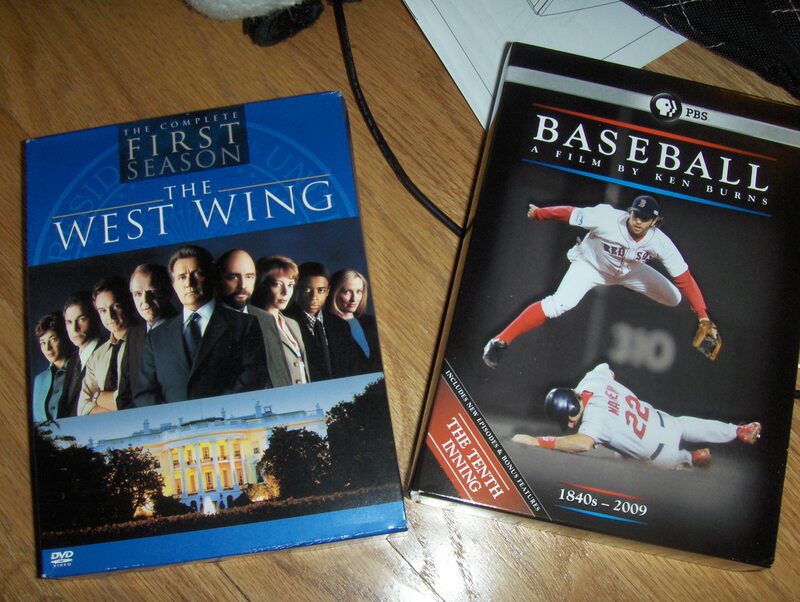 So I went to Barnes and Noble, and despite being insanely broke, I bought these two DVD sets just to have anything to keep my mind off of the horrible day. I tried to justify the purchase to myself by saying that it was necessary for my survival. I texted my friend Kevin (one of the big names on the list of people I dearly miss in Seattle) and asked him if my justification was valid. He was the one that introduced me to “Ken Burn’s Baseball” after all. He replied, “It totally goes with matches, rope, and Twinkies.” Good to know my money was well spent.